DIRECTIONS: On Route 11, head west from Bangor. Drive north 3.3 miles on the Wagner Road. Turn west (left) onto Route 32 (South Bombay Road) and then take another immediate left onto Cemetery Road. 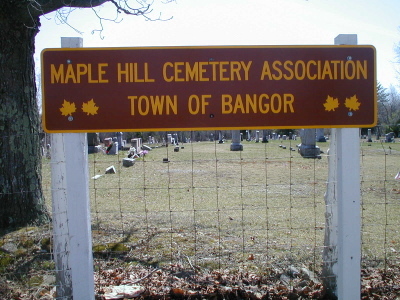 The cemetery is .3 miles from the intersection on the south side of the road. 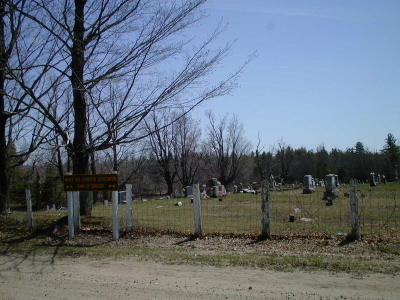 This cemetery was transcribed by Joyce M. Ranieri 29 April 2001. Calvin S. ALDRICH Died June 15, 1895 Age 67 Yrs. notes the songbird that you always used to love. where in glory we may meet in heaven above. Ara E. BARNES Died Feb. 8, 1901 Age 82 Y'rs. Corporal of Co. I Heavy Art. _____ Vol. Polly STANDISH Wife of Moses BEAN Died Oct. 30, 1887 AE 90 Y'rs. Sarah A. 2nd Wife of Adolphus BUEL Died Apr. 12, 1874 AE 33 Y'rs. & 6 Mos. Ezra BUELL Died May 26, 1880 Age 89 Yrs. Lucy BARTER His Wife Died March 7, 1891 Age 95 Yrs. Lottie Wife of Warren BURNAP Died Mar. 12, 1873 AE 23 Y'rs. Also Their Infant Dau. Died May 16, 1873 AE 2 mo's. & 9 d's. Clara SLATE Wife of John CARR Died Mar. 2, 1888 AE 32 Y'rs. 2 Ms. & 2 D's. PFC HQ CO. 143 INF. REGT. Alvey CHESMER Died Nov. 17, 1882 AE 52 Yrs. & 10 Mo. Eliza Jane Wife of Abner CHESMORE Died Mar. 22, 1860 AE 38 Yrs. 2 Mos. Libbie CHESMORE Died Oct. 10, 1884 AE 32 Y'rs. & 6 Mo's. Footstones: Mother, Father, Mother, Earla J., Effie E., Orin T.
Orin CLARY Died Feb. 9, 1854 AE 53 Yrs. Abigail CLARY Died Oct. 8, 1873 AE 72 Yrs. Died Oct. 15, 1894 AE 11 Mo's. John DELARM Died Jan. 31, 1894 AE 82 Y'rs. 3 Mos. Wallace GREEN died June 10, 1861 AE 72 y'rs. Hellen M. Wife of B. S. ELLSWORTH Died Jan. 24, 1890 AE 36 Y'rs. Delbert H. Our Son Died Apr. 5, 1890 AE 11 Y'rs. 7 Mo's. Addie M. Died Sep. 29, 1867 AE 5 y'rs. & 10 d's. Wilbur W. Died Aug. 24, 1870 AE 3 y'rs. & 8 m's. Ezra FULLER Died Dec. 18, 1864 (or 1861) Aged 68 y'rs. Willard N. Son of Lyman & Ella FULLER Died May 13, 1900 AE 3 yrs. 4 m.
Willard C. Son of G. N. & M. A. FULLER Died August 8, 1871 AE 13 yrs. 5 m. 13 ds. With Christ his living head. Daisy L. Died Dec. 16, 1884 AE 4 y'rs. 6 m's. 19 d's. Clark D. Died Dec. 17, 1884 AE 2 y'rs. 8 m's. 20 d's. Harriet D. daughter of Ransome & M. GIBBS Died Apr. 18, 1857 AE 9 m'os. & 2 ds. Footstones: Mother, L.M.G., L.L.G., J.G.G., N.R.G. Florence & Frances Twin Daus. of W. J. & M. A. GREEN Died 1910 & 1911 AE 4 & 10 mo. George W. Son of Ira J. & Dora GREEN Died Nov. 2, 1877 AE 1 Year 8 Mo's. Eva L. Dau. of Ira & Dora GREEN Died July 5, 1902 AE 14 Yrs. 5 M. Gone but not forgotten. George W. Son of Sidney & Matilda GREEN Died Jan. 15, 1890 AE 9 Y'rs. 3 M.
Wallace GREEN Died June 10, 1861 Æ 72 Yrs. William HAKINS Died Nov. 1, 1885 AE 67 Y's. 14 D's. Hue HARDY died Jan. 21, 1880 AE 60 yrs. Laura A. Wife of J. W. HARDY Died Apr. 15, 1877 AE 23 Y'rs. Rachel F. MOORE Wife of John W. HARDY Died July 5, 1872 AE 22 Y'rs. & 5 Mo's. Rachel A. Died July 12, 1872 AE 3 Mo's. & 16 D's. Betsey GRIFFIN Died Feb. 10, 1878 AE 86 Yrs. Alaric L. HARVEY Died Jan. 24, 1880 AE 21 Yrs. 1 Mo. 7 Ds. Footstones: Sophia, Father, Mother, Betsey, Alaric L.
Ernest F. Son of A. A. & E. L. HOUSE AE 5 M's. Rev. A. A. HOUSE Died May 15, 1909 AE 36 Y'rs. 2 Mos. 10 Da's. Died in Ft. Covington Nov. 30, 1868 Genie Son of F. L. & R. KELLEY AE 8 Mos. 23 D.
Aggie Dau. of S. & M. KELLY Died July 24, 1888 AE 3 Days Gone but not forgotten. Samuel KINGSTON Died Mar. 31, 1884 AE 53 Y'rs. Margaret KINGSTON His Wife Died Sept. 22, 1892 AE 50 Yrs. George E. KINGSTON Died Mar. 22, 1888 AE 17 yrs. Charles LaBRUM Born Mar. 27, 1825 Died at Annapolis, Md Apr. 5, 1865 Mem. Of Co. I 148 Reg. N.Y. V'ol. Eva Daughter of Peter & Nettie LAPREE Died Oct. 27, 1886 Age 1 Yr. 4 Mos. Eva Dau. of Peter & Nellie LAPREE Died Oct. 27, 1886 AE 1 yr. 4 mos. W. LeRoy LaPREE 1890 - 1921 Priv. 1st Class Battery E. 320 Field Art. 82nd Div. Robert S. LaPREE Son of Wm. & P. J. LaPREE Died July 21, 1911 AE 11 Y'rs. 8 Mo. 8 Da. Ella M. McARTHUR Died July 22, 1890 AE 33 Y'rs. Our loved one is at rest. Edgar L. Died Jan. 29, 1872 AE 2 M's. 11 D's. Sadie Ray Died July 28, 1883 AE 1 Yr. 1 M. 11 D.
Evaline, Wife of F. McDANEL Died May 1, 1888 AE 39 Y'rs. Sadie Ray Dau. of F. & E. McDONALD Died July 28, 1883 AE 1 Y'r. 1 M. 11 Ds. William MOORE Died Oct. 30, 1880 AE 57 Yrs. & 6 Mos. With Jesus never to part. Jane Wife of Wm. MOORE Died Feb. 11, 1890 AE 62 Y's. 6 M. & 11 Ds. Sarah J. Daughter of Wm. & J. MOORE Died May 6, 1863 AE 4 yrs. 1 m. & 10 ds. Almina Daughter of Wm. & J. MOORE Died Apr. 25, 1863 AE 5 y'rs. 11 ms.
Clark B. Son of J. T. & S. A. RICH Died Mar. 19, 1891 AE 19 Y'rs. & 1 Mo. Fredie W. Died Oct. 11, 1869 AE 5 Mo's. & 11 D's. Hazel G. Died Mar. 21, 1895 AE 1 mo. Joel T. RICH Died Mar. 6, 1902 AE 55 Yrs. 7 Ms.
G. W. ROBBINS Sep. 17, 1809 Jan. 4, 1893 Co. B 92 Reg. N.Y.V. Marilda His Wife Died Aug. 6, 1892 AE 73 Y'rs. James M. SABIN Died Sept. 25, 1890 AE 62 yrs. Dorinda His Wife Died June 17, 1890 AE 57 yrs. May Daughter of Jas. & Dorinda Died Dec. 4, 1884 AE 15 yrs. 9 ms. 11 ds. He thought it best and took me home. Charles P. SLATE Died Feb. 20, 1881 AE 65 yrs. 5 ms. & 17 dys. Ann Wife of Chas. P. SLATE Died Dec. 9, 1897 AE 80 Y'rs. We know you are at rest. Where the richer ones are blest. Carrie Daughter of Almadus & Minnie SMITH Died Aug. 8, 1895 AE 4 yrs. & 4 m's. Nettie S. Daughter of M. L. & M. M. SOUTHWORTH Died Aug. 30, 1863 AE 1 yr. & 7 mos. Mary E. Daughter of M. L. & M. M. SOUTHWORTH died Apr. 8, 1865 AE 4 w. & 6 ds. Phebe L. Dau. of E. & H. A. SOUTHWORTH Died May 10, 1896 AE 25 Y'rs. Samuel VIDGER Died Jan. 29, 1887 AE 80 Y'rs. Zalmon Y. WADE Died Oct. 14, 1893 AE 24 Yrs. 3 Mo's. & 11 Dys. A. B. WILSON Died Sep. 21, 1899 AE 81 Y'rs. Mary WILSON died Apr. 16, 1896 AE 62 Y'rs. Coroden P. Son of C. H. & Mary WILSON Died June 23, 1899 AE 17 Yrs. 9 Ms.
Jason WILSON Died Oct. 16, 1891 Aged 64 Y'rs. 7 Mo's. Betsey P. WILSON Died November 23, 1898 Aged 71 Years, 4 Mo's and 23 Days.